It’s Sunday afternoon as I write this blog. The show continues today until 6 PM, and then finishes tomorrow, Monday, at 3 PM. Monday is usually a complete washout, so I don’t see any reason to delay my post until Tuesday. If anything significant happens on Monday, you’ll hear about it on Thursday. The show started last Thursday with a very well attended preview party. Amazingly, business was good at the party, but only to my existing clients. If there were no party, they would have made the same purchases the next day. Attendance was fairly light on Friday, as the party stole much of the thunder of opening day. It continued only at a moderate pace for the entire show. Personally, my show went well, but not as I would have guessed. My best client, who I had hoped would be a substantial buyer, bought nothing. Luckily, other clients stepped up to the plate, so we’re pleased with our results. As expected, most of the action was in French glass and Tiffany lamps and glass. In asking around to a handful of dealers, I heard the following comments. An Art Nouveau dealer, new to the show, was very pleased with his results and is looking forward to next year’s show, while a Tiffany dealer, not new to the show, reported disappointing results. A majolica dealer said she had a good show. Among general dealers, one was very happy and another unhappy. A dealer in general merchandise and jewelry said he brought less this year, but sold more jewelry. An art dealer told he made only two sales and broke even. A silver dealer was pleased that his results were much better than last year, and finally a furniture/Americana dealer was very unhappy with his results. Overall I heard more good reports than bad. 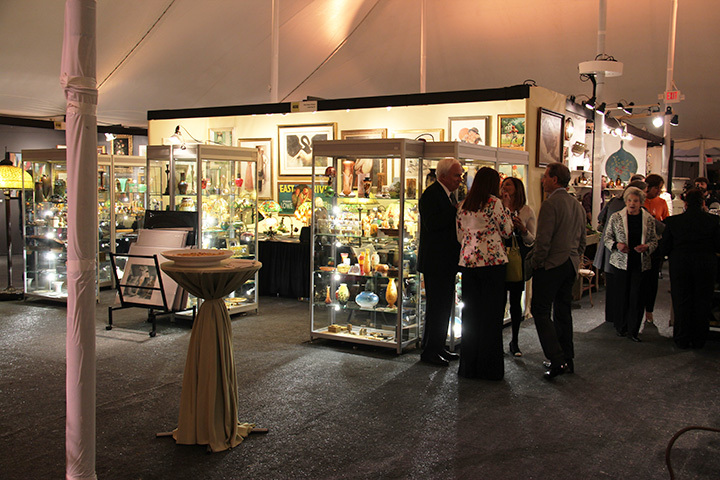 Many of the dealers at the show are up in arms about the proposed Navy Pier show by the Palm Beach Show Group. 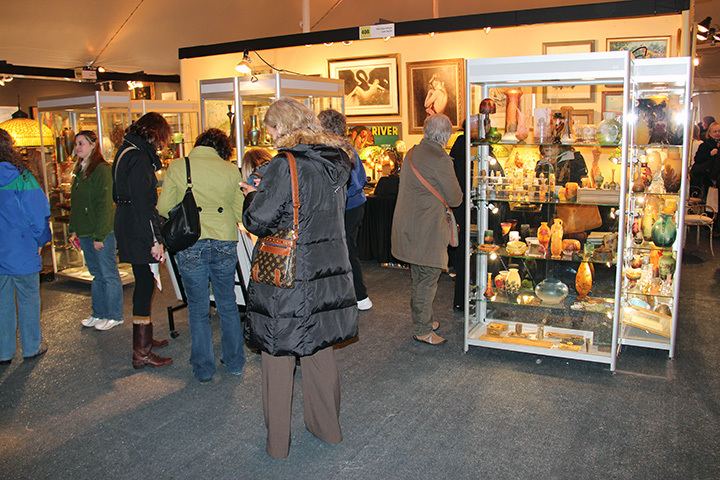 PBSG intends to hold a show the same weekend as the April, 2014, Merchandise Mart show. Not sure why PBSG wants to do that, as there isn’t enough buying power in Chicago to support two major antique shows at the same time. We’ll see what shakes out. 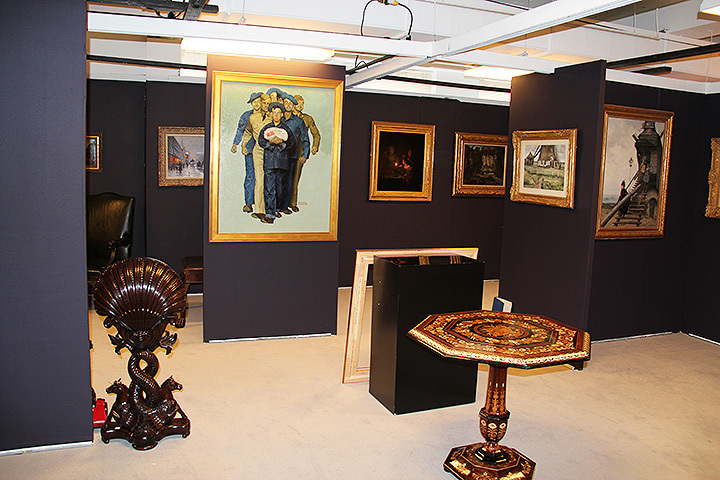 The Merchandise Mart International Antiques Fair will host a preview party tonight, April 25, 2013, and then open to the public tomorrow, Friday, April 26, 2013, at 11 AM. It will continue until Monday, at 3 PM. The show looks fabulous, with the usual coterie of important national dealers. There have been some dealer changes, as always happens, but the replacement dealers are all from the A-list. The show is classy, fun, intimate,and crowd-pleasing. If you’ve never visited this show, it’s worth a trip from anywhere. 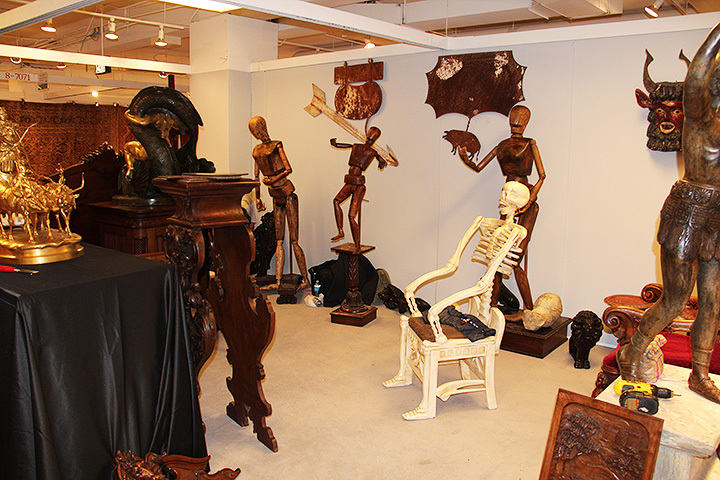 I made a few inquiries about the future of the Merchandise Mart International Antiques Fair. Management told me the rumors of the show’s demise are untrue. They will be passing out renewal contracts on Saturday. So I stick by my opinion that the arrival of a new antique show at the Navy Pier in April, 2014, the same weekend, is a big mistake. I hope the Palm Beach Show Group will reconsider, and change their dates. You know I’m not a fan of preview parties, but the party at the Chicago Botanic Garden Antiques and Garden Fair was one of the better ones. Some show promoters treat dealers as second-class citizens at preview parties, offering one little box of airline food for the evening. At the Botanic Gardens, the dealers were treated equally, with plenty of delicious food and drink for everyone. I even made a nice sale at the preview party — can you believe it? OK, so much for the weather report. There’s a big crowd already, about 90% women, most of whom seem unknowledgeable. No sales yet, but that’s understandable, as unknowledgeable people rarely buy. Haven’t seen most of my Chicago clients yet, but I’m hopeful they’ll attend. Friday, 3:00 PM. Thought it would get more crowded in the afternoon, but the opposite happened. It’s much quieter now. The heat was fixed and then it broke again. One small sale so far. Still have my coat on. Friday, 5:00 PM. It’s been a trying day — one of the toughest we’ve had to endure at any show. It was very cold most of the day, where the chill gets into your bones. We made one additional medium sale, so we’re slowly chipping away at the results. Saturday, 1 PM. It’s the first sunny day since we arrived and very pleasant in the tent. Lots of people here all day so far. Nice sale to one of my established clients. Sure would like to make a sale to a stranger. Saturday, 5 PM. Much thanks to my clients for showing up and making purchases. Even made a moderate sale to a new client. The show is now going well and hopefully will get better. Another important client is considering making a major purchase. Sunday, 11:30 AM. The day is off to a slow start, but that’s to be expected on a Sunday. The show should have opened at 11 AM, not 10 AM. Jeanne Stella, you listening? Several naive inquiries will likely lead nowhere, but on the other hand, the weather is lovely and the tent is very comfortable. Sunday, 2:20 PM. After a slow start today, it got really busy. Made a couple of sales to strangers, which was very gratifying. I’ll be surprised if anything happens between now and the end of the show, but hope springs eternal. Sunday, 5:00 PM. The show is over and as I predicted, nothing happened from mid-afternoon to closing. It was a busy day, but not as remunerative as it should have been, based on the activity. Overall, the show went well. More sales to new clients would have made it better, but I’m not complaining. In other news. The Palm Beach Show Group (who run the Palm Beach and Baltimore shows) has announced that it will be starting a new show in Chicago at the Navy Pier. Ordinarily I would be excited to hear such news, but not this time. 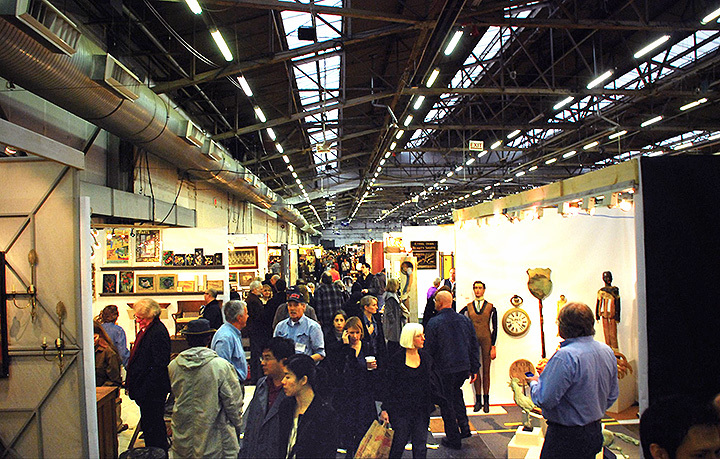 They hope to run the show exactly the same week as the Merchandise Mart Antiques Show in April, 2014. Why choose that week, when there are 51 other weeks? There are rumors that this will be the last year for the Merchandise Mart Antiques Show, in which case it would make sense to run an important show in Chicago the same weekend. Other than that, it seems folly. I’ll try to get to the bottom of it. 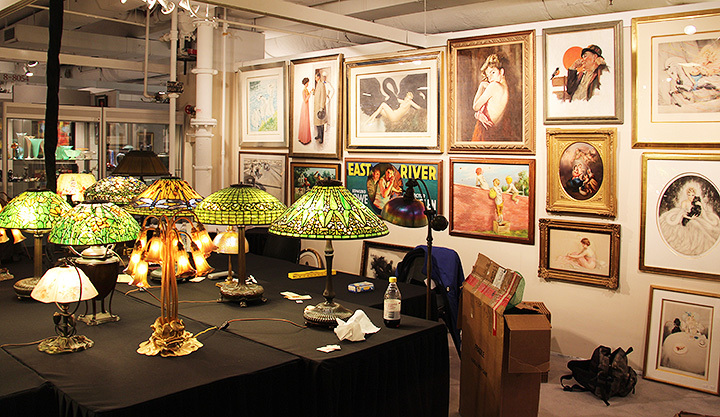 Speaking of the Merchandise Mart Antiques Show, it’s this week! The show opens with a preview party on Thursday night, April 25th. It opens to the public on Friday, April 26th at 11 AM and continues until Monday, April 29th at 3 PM. It’s a great show and my favorite of the year. Make sure you attend. You won’t be disappointed! The antiques business is not supposed to be exciting (though sometimes it is). If I wanted excitement, I would have become a sky-diving instructor. Do you remember the time we drove into a fierce snowstorm on our way to a show in Palm Beach? Click here to refresh your memory. Or the time we went through an earthquake and a hurricane at the same show? Click here to read about that one. So what happened this time? Just a bomb scare at LaGuardia airport, a country-wide outage of the entire American Airlines fleet and evacuation of our tent at the Chicago Botanic Garden Antiques and Garden Fair. Tuesday was supposed to be a low-stress day. We were to fly out of New York at 4:10 PM, arrive in Chicago at 6 PM, and then spend a leisurely evening, before starting to set up our show at the Chicago Botanic Garden the next day. After hearing about the bomb scare at LaGuardia Airport, I checked the American Airlines website to make sure our flight was still on time. The website said “on time”, so we took a taxi to the airport and got on line. When we reached the representative, she told us that no flights were leaving LaGuardia and our flight had been cancelled. So much for checking with American. Flights were to resume at 5 PM, so we got on a very long line to get on another flight. While on line, we heard our names being called for our original flight (on which we were upgraded to first class). By the time we reached a representative, we had to take a 6:50 PM flight, which was delayed to 7:30 PM. We had to sit near the back of the plane, in cramped seats. By the time we got to our hotel room in Chicago, four hours late, we were frazzled and exhausted. Wednesday should have been a normal show setup day. It was anything but. We had to set up our booth, in a tent, in a raging storm. At one point, lightning was in the area, so we evacuated the tent until the threat passed. Other times, the rain was so torrential, it pounded on the tent. Water dripped into some booths from leaks. Luckily, our booth stayed dry. If history is any indication, this show will be a success, as both of our previous stressful shows ended well. The Chicago Botanic Garden Antiques and Garden Fair is beautiful and high class. Do yourself a favor and visit this outstanding show and see our booth in the Rose Garden tent. I guarantee you won’t be disappointed. 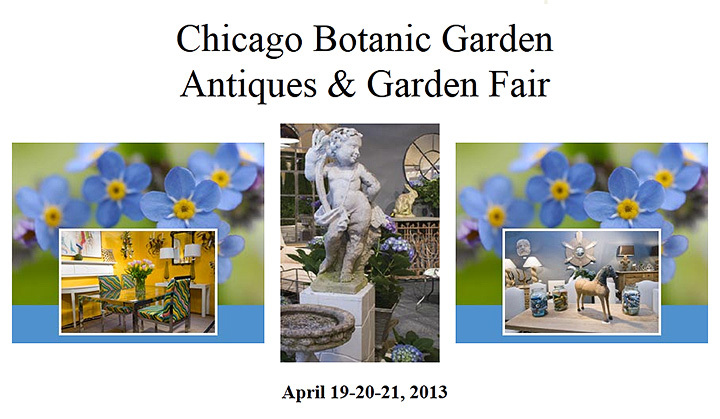 The Chicago Botanic Garden Antiques and Garden Fair opens to the public on Friday, at 10 AM. It continues until Sunday, April 21st, at 5 PM. 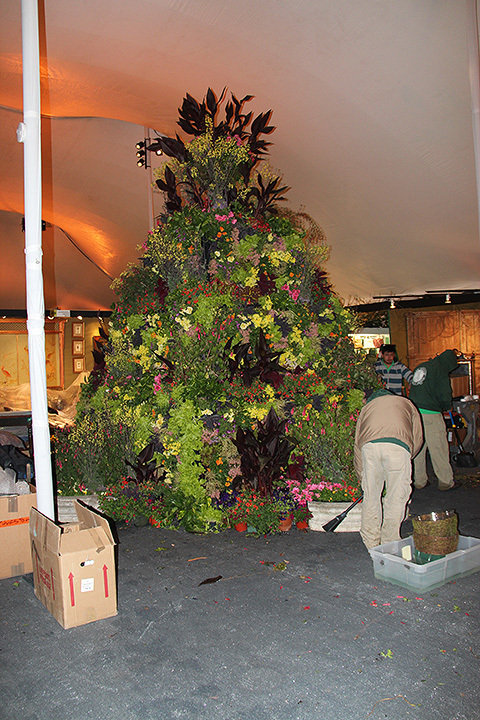 It’s located at the Chicago Botanic Garden, 1000 Lake Cook Road, in the beautiful village of Glencoe. It’s been six months since we last exhibited in Chicago. We love the city and have many friends, so we’re excited to be coming back this week to exhibit at two shows, back to back. 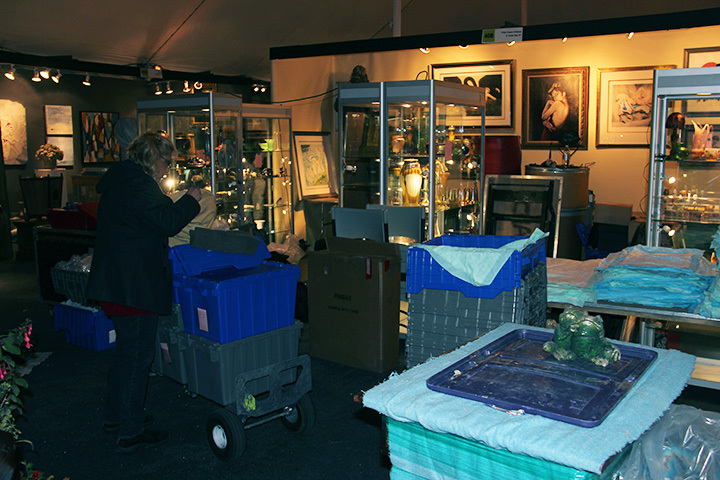 The first, the Chicago Botanic Garden Antiques and Garden Fair, starts setting up on Wednesday and opens to the public on Friday, at 10 AM. It continues until Sunday, April 21st, at 5 PM. It’s located at the Chicago Botanic Garden, 1000 Lake Cook Road, in the beautiful village of Glencoe. It seems a little strange to exhibit at a Garden Fair, but I’ve been assured that there are enough antiques dealers to call it an “Antiques and Garden Fair”. I hope it works out, especially because the Arlington Racetrack Antiques Show was cancelled. This show could be the perfect replacement. 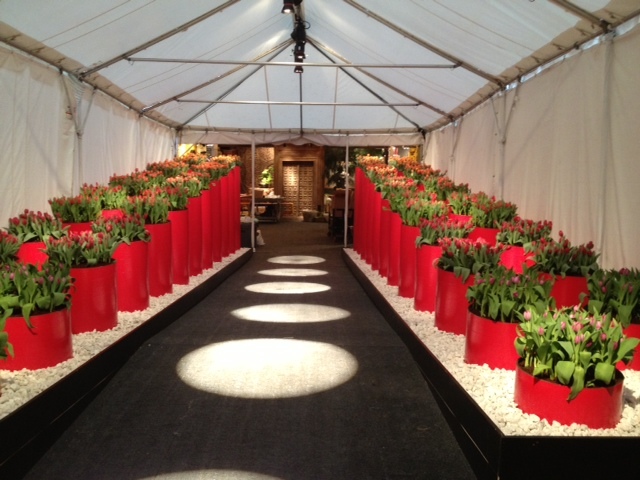 Stella Show Management always does a good job, so we’re confident the show well be well run. Now all we need is for the public to do their part. It would be our pleasure to make the show a permanent addition to our schedule. Click here for more information about the show. 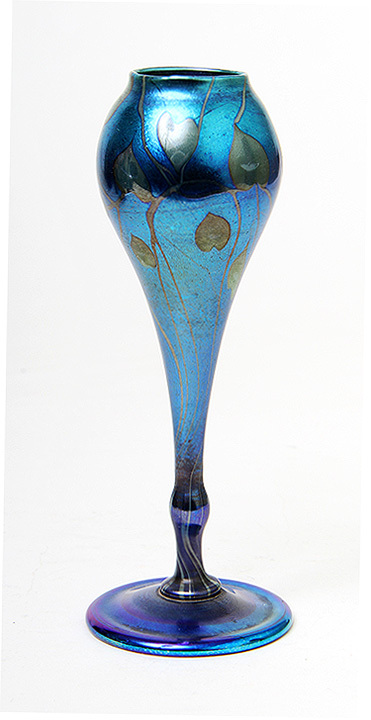 We’re bringing all the goodies we purchased on our recent, successful, European buying trip, as well as our beefed up selection of Tiffany Studios glass and lamps. I don’t think you’ll be disappointed in our display. Please try to visit us. 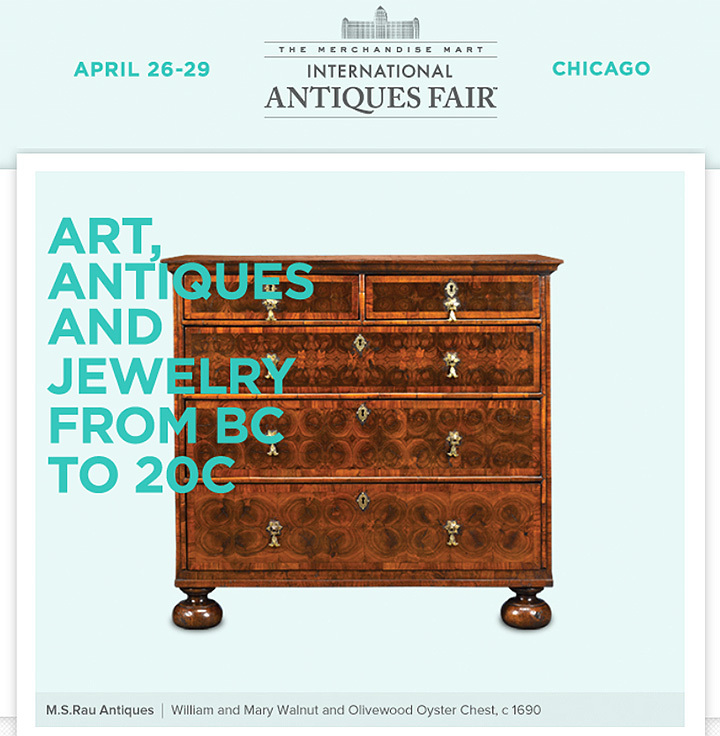 If not this week, then the following week at the fabulous Merchandise Mart International Antiques Fair in downtown Chicago. We’ve been busy lately, buying up a storm for our upcoming shows in the Greater Chicago area, starting next week. Some of our superb purchases came from a very successful European buying trip last week. 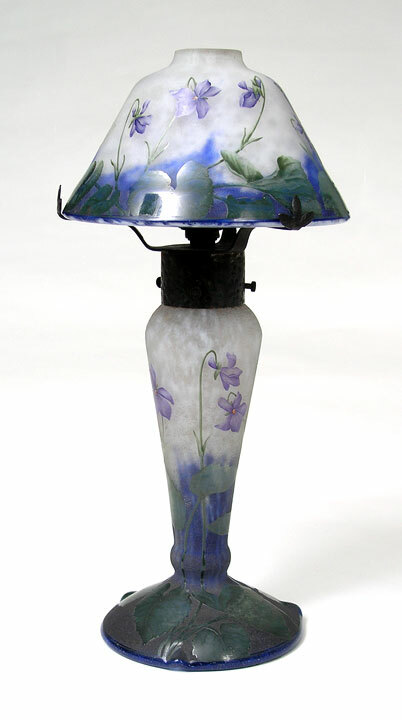 We’ve pumped up our already fine collection of Tiffany glass and lamps and French cameo glass. I photographed all of our newest treasures, but it’s time-consuming to put them on my website, so they’ll get added day by day. Please check frequently for additions. Click here for the home page of my site. 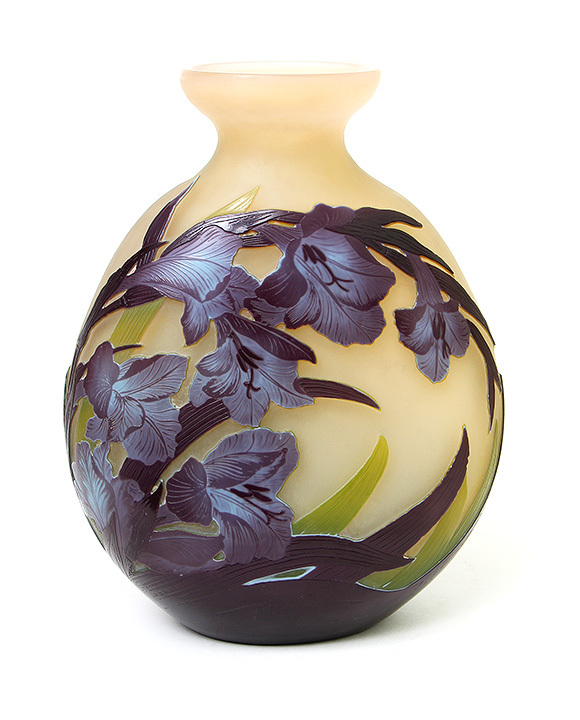 New additions of Gallé, Daum and Argy-Rousseau glass will be on the site soon, including a Gallé hyacinth blownout vase with exceptional color. I was offered four different Gallé hyacinth blownout vases and chose to purchase only this one, because it was hands-down the best. 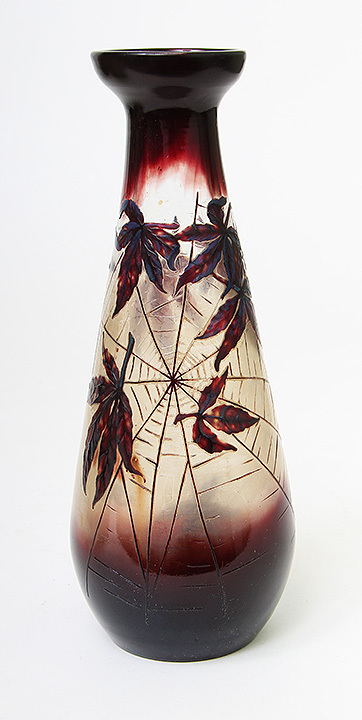 Also coming are Gallé scenic and floral vases, Daum spider web vases and a fine Argy-Rousseau pate-de-verre geometric vase. 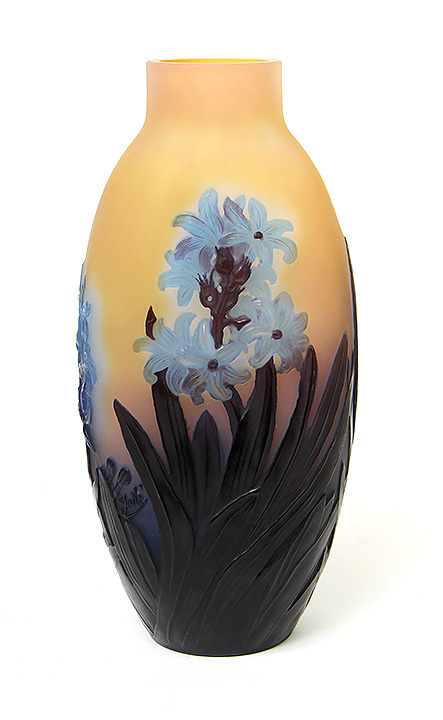 Tiffany Favrile glass vases are well-represented in the newest selection. 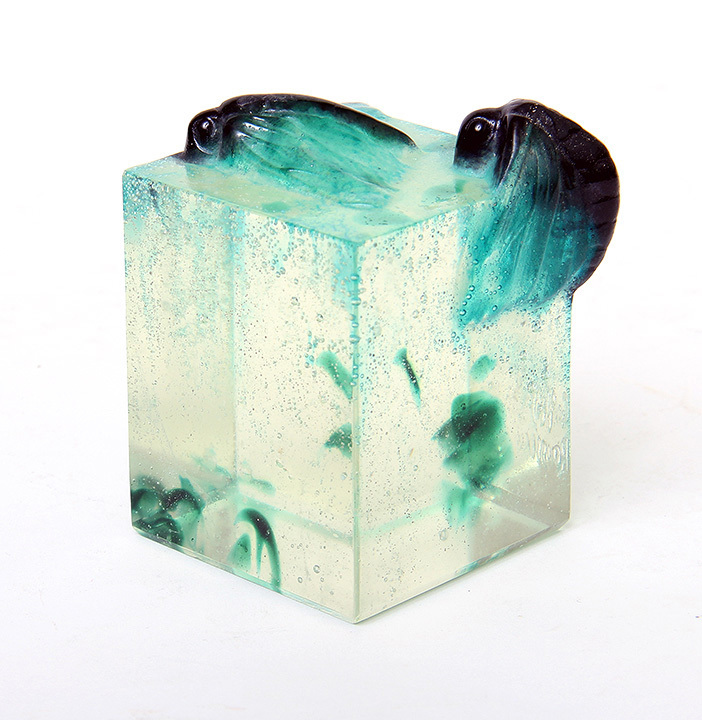 Two of them are deep blue with green hearts and vines decoration — both small and wonderful. 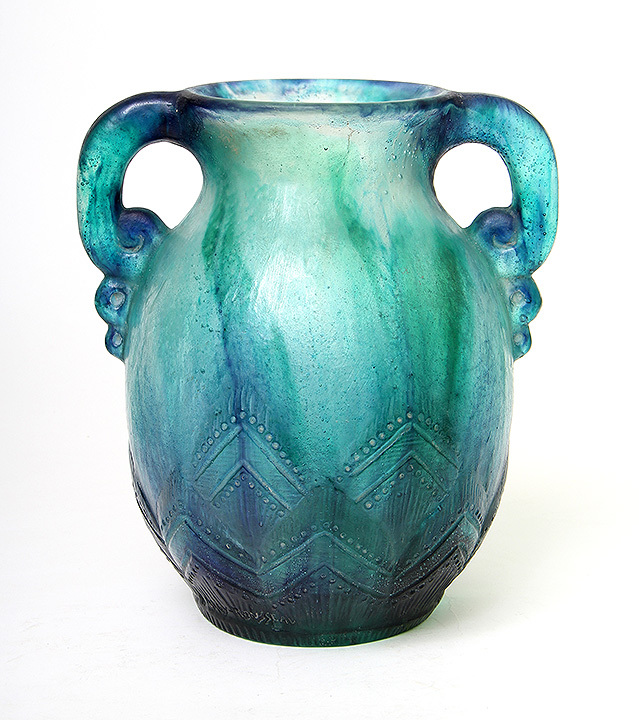 Several green decorated Favrile vases are also in the newest group. 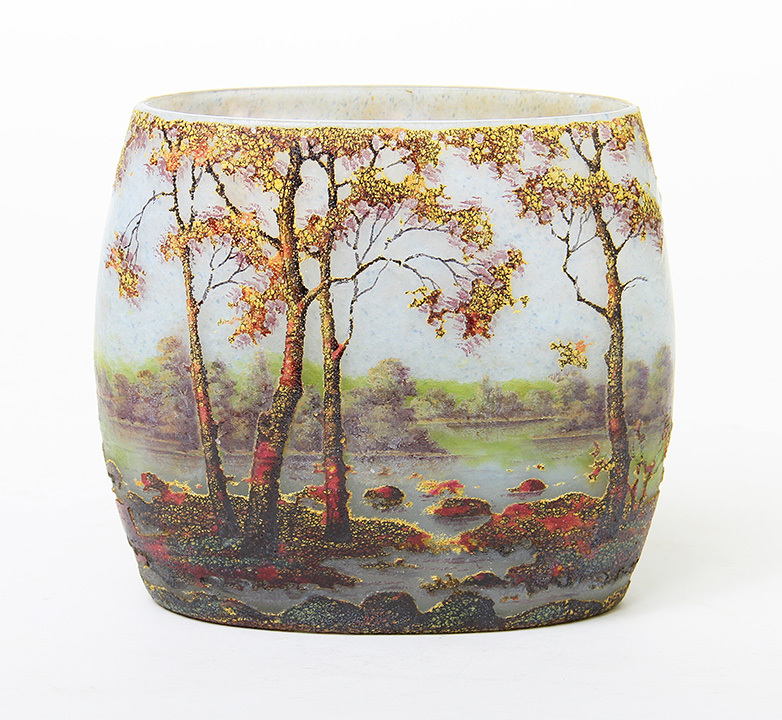 You can view our entire inventory, including all of our new items, starting next Friday, April 19th, at the Chicago Antiques & Garden Fair, Chicago Botanic Garden, 1000 Lake Cook Road, Glencoe, IL. It will be our first time there. Hopefully the show will be good for us, so we can make it a regular show on our schedule. We have many clients in the greater Chicago area, so if a show fails, we need a replacement. The show opens to the public on Friday, April 19th, at 10 AM, and continues until Sunday, April 21st, at 5 PM, so you’ll have plenty of time for a visit. Click here for more information about the show. The week after the Chicago Antiques & Garden Fair, we’ll be exhibiting in downtown Chicago at the fabulous Merchandise Mart International Antiques Fair. Make sure you come to one or both of the shows. You will not be disappointed! 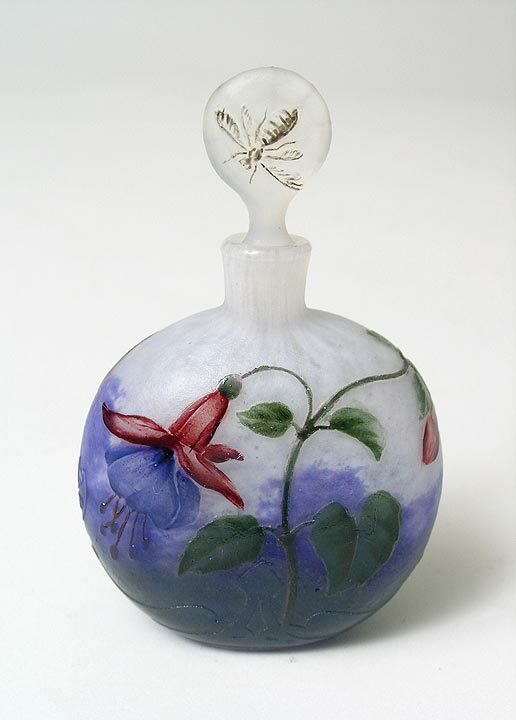 Know your French Cameo Glass flowers! I’ve addressed this topic in a previous blog post, but I thought it relevant enough to address again. 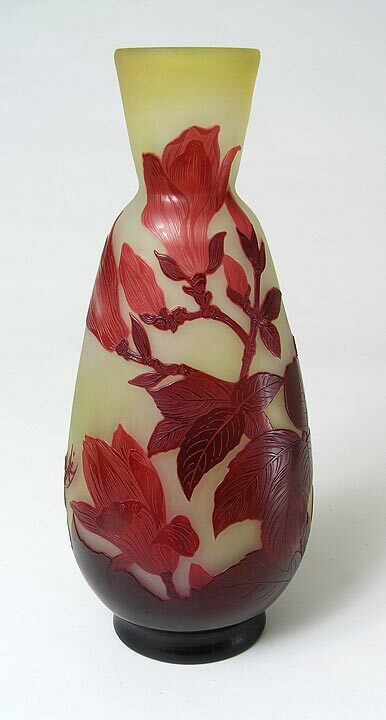 When I first started dealing in French cameo glass almost forty years ago, I referred to the vases as having red flowers or blue flowers, for example. Then a Japanese client asked me “What flower”? I was perplexed. I clearly remember thinking that no one had ever asked me that question before. What difference did it make? Apparently a big difference. 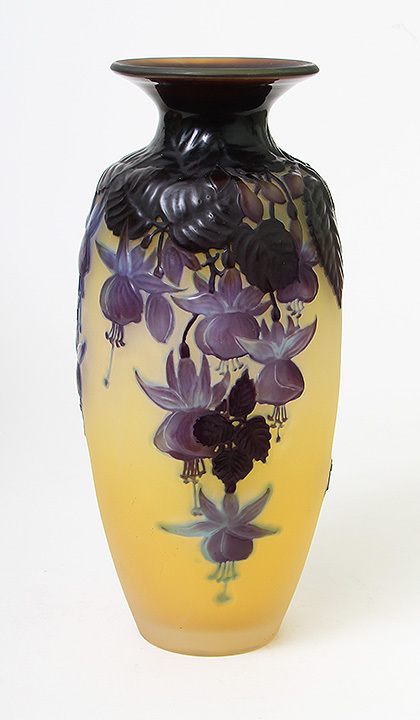 Japanese buyers virtually took over the French cameo glass market in the late 1980s. They had very specific likes and dislikes and were willing to put their money where their mouths were. Violets were so desirable that a serious premium was put on the vases. It still exists today, even though most of the buyers are not Japanese. Chrysanthemums were flowers for Japanese funerals, so it was very difficult to sell a vase with chrysanthemums, especially white or yellow, to a Japanese buyer. 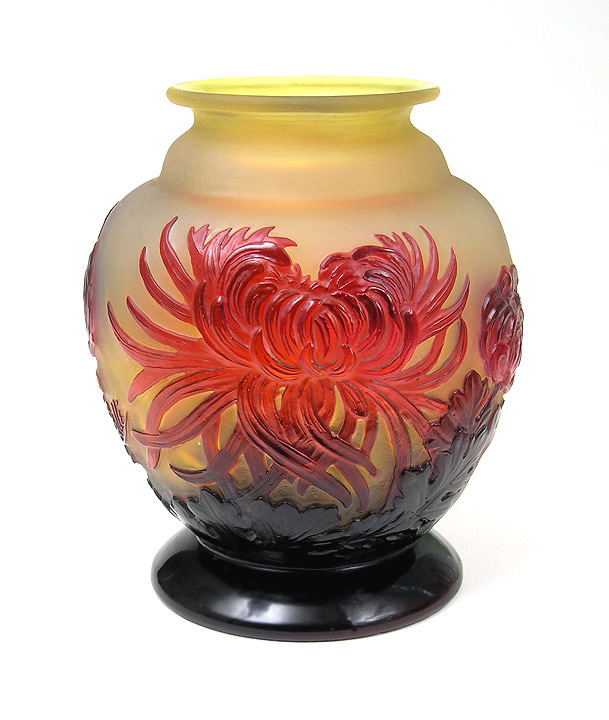 Americans have no such aversion to chrysanthemums, in fact quite the opposite, making it easy to sell a vase in the US. So which are the best flowers? Violets, roses, and magnolias, to name a few. Generic-looking flowers, tiny flowers, tobacco flowers and any flowers with weak colors are the worst. Collectors like color, so good color and contrast are important. Red, blue, purple, and pink are desirable colors. Brown, green, and orange are less desirable, unless strong. Muted color is not an asset. These are observations from a dealer’s point of view — I know what sells and what doesn’t. 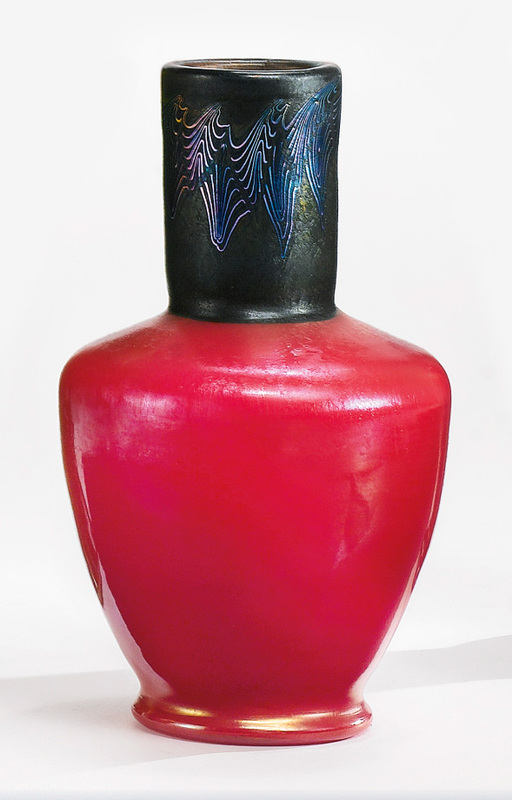 Most people can agree when they see a pretty vase. If you like it, chances are others will too. That’s the one you should buy. Our show schedule in April begins late next week, with the Chicago Antiques & Garden Fair at the Chicago Botanic Garden, 1000 Lake Cook Road, Glencoe, IL. It will be our first time there. Hopefully the show will be good for us, so we can make it a regular show on our schedule. We have many clients in the greater Chicago area, so if a show fails, we need a replacement. 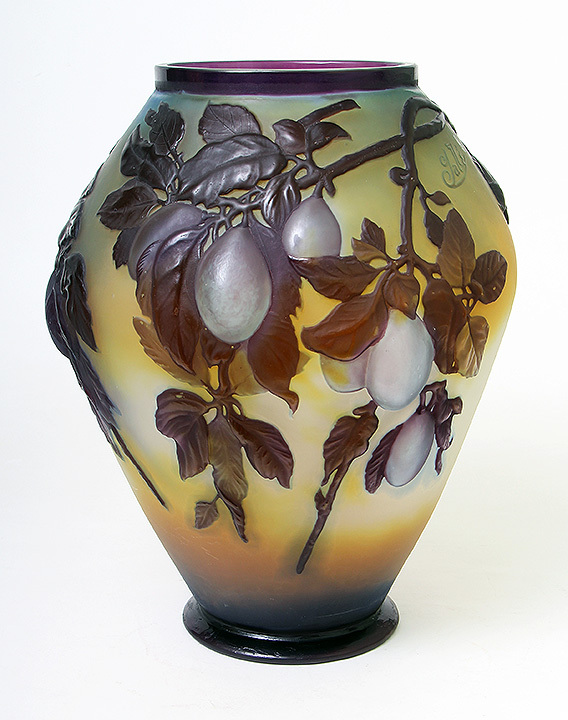 We’re bringing an impressive group of items that will be shown for the first time in Chicago, including Tiffany lamps and glass and French cameo glass by Gallé and Daum. Please visit us at the show. It opens to the public on Friday, April 19th, at 10 AM, and continues until Sunday, April 21st, at 5 PM. Click here for more information about the show. Cottone Auctions held a big, diverse, 861-lot sale March 22-23, 2013, with very successful results. 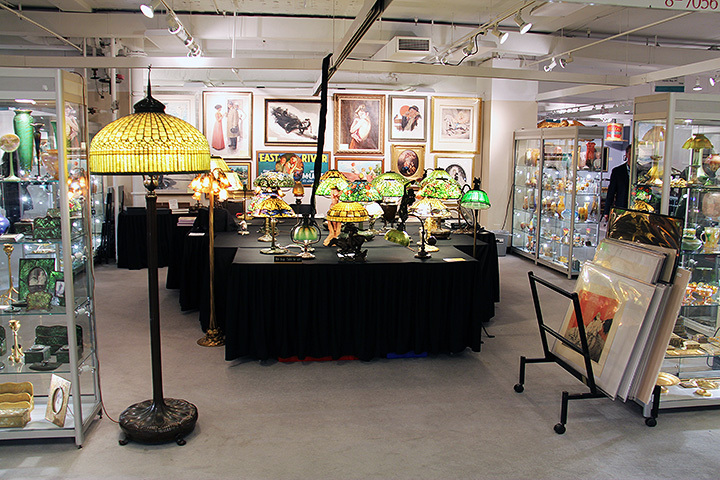 Included in the sale were some excellent, fresh-to-the-market lamps and art glass. 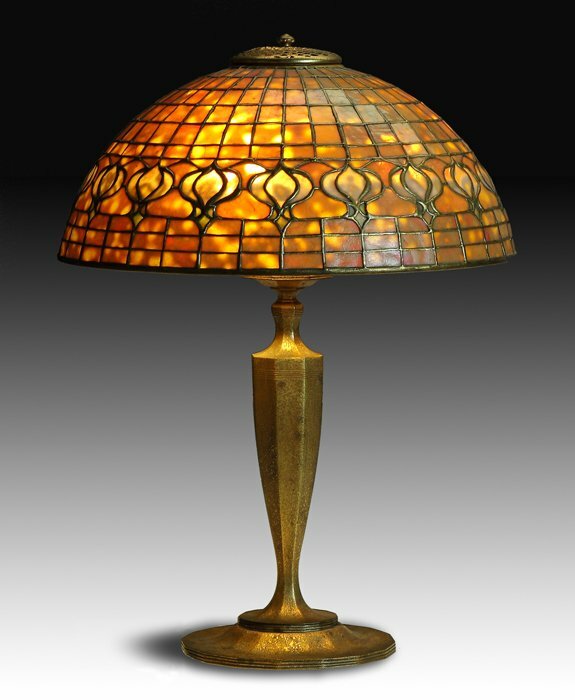 Lot #496 was a Tiffany Studios Pomegranate table lamp, which usually makes everyone yawn. 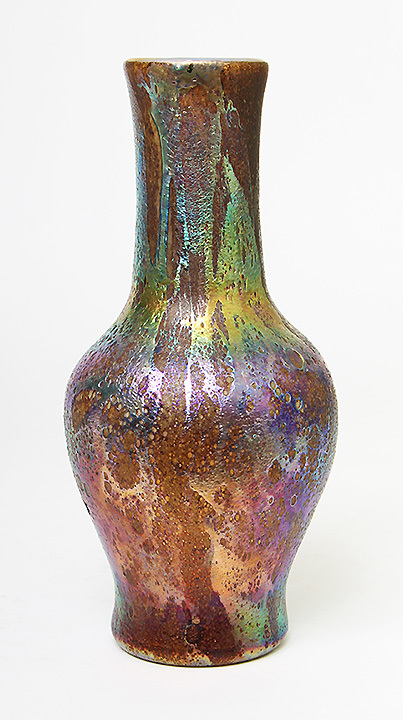 This example, however, was special, with great glass — heavily mottled and dichroic (color-changing from unlit to lit). It easily exceeded its pre-sale estimate of $8,000 – $12,000, to sell for $20,125, including buyer’s premium. 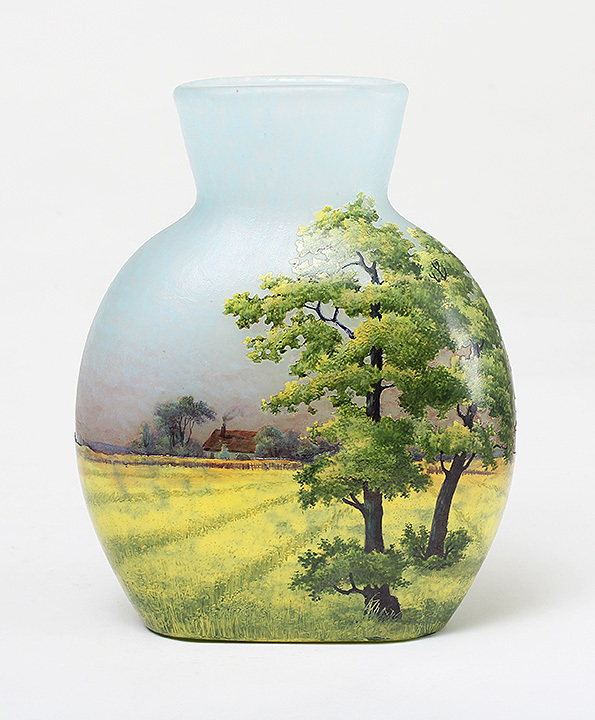 The best Tiffany Favrile vase in the sale was a vivid paperweight, 11½” tall. It handily exceeded its estimate of $5,000 – $8,000, to sell for $11,960. 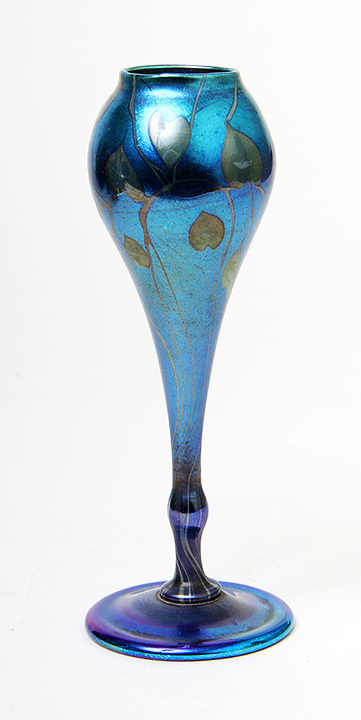 The best French cameo glass vase in the sale was an unusual fire-polished, footed Gallé vase, with an interesting bulbous knop above the foot. It sold for $8,510, toward the high end of the pre-sale estimate of $5,000 – $8,000. As any good auction house should, Cottone estimated most lots very conservatively. That should be the golden rule for auction houses, as it creates a virtuous circle. 1. The public know the items are there to be sold. 2. Everyone thinks they’re in the game, so they participate. 3. The results are strong, so the high estimate is often exceeded. 4. Everyone is happy, including the buyer, the seller and the auction house. How can you beat that? For the complete results of the Saturday portion of the sale, click here. Our show schedule in April begins with the Chicago Antiques & Garden Fair at the Chicago Botanic Garden, 1000 Lake Cook Road, Glencoe, IL. It will be our first time there. Hopefully the show will be good for us, so we can make it a regular show on our schedule. We have many clients in the greater Chicago area, so if a show fails, we need a replacement. 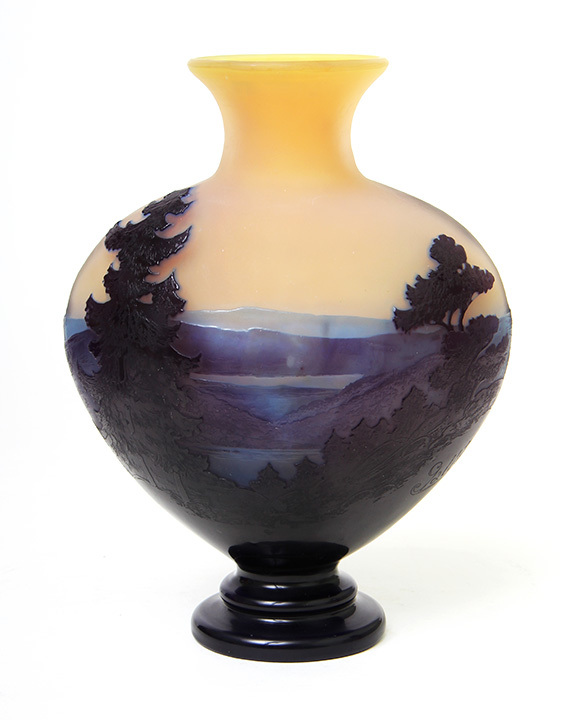 We’re bringing an impressive group of items that will be shown for the first time in Chicago, including Tiffany lamps and glass and French cameo glass by Gallé and Daum. Please visit us at the show. It opens to the public on Friday, April 19th, at 10 AM, and continues until Sunday, April 21st, at 5 PM. Click here for more information about the show.